Sometimes you read a book that you wish you’d written yourself. I’ve enjoyed Sharon Bolton’s books ever since I discovered them a few years ago. The fact that I’ve not read her novels in any particular order, and the early ones are still unread, goes to show that if a series is well written, it doesn’t really matter in what order you read the books. A Dark and Twisted Tide is the latest thriller to feature to Lacey Flint. Flint is an intriguing character with an interesting back story. As a reader you get glimpses into the character’s past but never the whole picture. Every reveal make you want to discover more and yet the character never seems contrived. It’s a delicate balance for a writer and Bolton knows how to achieve it. In this latest book, Lacey is is no longer a detective and is living on a house boat while working for the river police. She finds a body floating in the river, wrapped in a white shroud, and it seems that the corpse was placed deliberately for her to find. She manages to connect the killing to that of other missing women and places her own life in danger when it becomes clear that the murderer is trying to entice Lacey into becoming the next victim. Setting the narrative in the heart of the Capital’s houseboat community gives the book an unreal quality as this is a London that we don’t normally see. Lacey swims every day in the river and the swell of the tide mirrors the relentlessness of the killings which are, at times, overwhelming in their frequency. As usual, the other characters are as well drawn as the main protagonist. In particular, DI Dana Tulloch, in her longing to have a baby with her partner, makes an interesting sub-plot. I find Bolton’s books so compelling that often the last few chapters pass by in a blur. It was exactly the same with A Dark and Twisted Tide. and I’m looking forward to the next installment and more revelations about Lacey’s past. Thanks to Transworld for the review copy. I’ve read the first two Lacey novels – a lot of the revelations about Lacey’s past are in the first book, btw, and it probably would have benefited from being read first. I loved the first one and the second was good, although the plot was a little contrived, not helped by having a clichéd idea about some aspects of Oxbridge student life, which irked me more than it should as it was my stamping ground. Been meaning to get round to book three for a while, so thanks for the prompt. I thought I might have missed quite a lot of backstory by not reading the first couple of books. But I’m quite enjoying the slow reveal anyway. Thanks! I thought of ‘Offshore’ while I was reading this too, Moira. I haven’t read Barry Maitland’s book but I’ll add it to the list. Sarah – A great review as ever. And what an interesting context for this novel – the houseboat community. 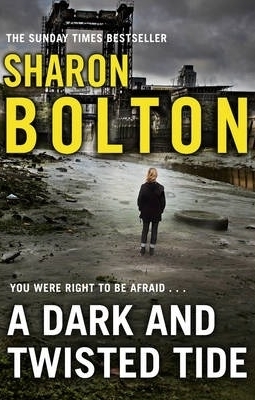 Another side of the city, and it sounds as though Bolton also shares with readers what it’s like among the river police. Fascinating! Thanks, Margot. And I love the idea of Lacey swimming in the river as a backdrop to the story. Ha, at last someone else who reads books out of order… I do worry sometimes that I’m missing out on things, but I find skillful writers are good at giving you sufficient background. I totally agree, Marina Sofia and, like you, I’m always reading series out of order. Sounds good. I haven’t read any of her books but I’ll put this on the staggering-over TBR list. Thanks, Kathy. Do come back and let me know what you think of it. When I get one of Sharon Bolton’s books I get followed around the house by two daughters asking if I’ve finished it yet and why I’m taking so long to read it (I’ve had it about two hours)… I’m really looking forward to this one. I love Bolton’s work. I think she is by far and away the best of the young women crime writers out there at the moment. Have you read the three one offs that she wrote before embarking on the Lacey series? If not, then I can really recommend them, especially the first, ‘Sacrifice’ where the basic proposition behind the crime was just this side of possible and extremely chilling. Hi Alex, I haven’t read any of the one-offs but I’d certainly like to read them when I get a chance. I loved the previous one in the series, actually, the only one I have read. I am also very proud to have seen her “come out of the closet” and change her publishing name from “S.J” to “Sharon”, because it’s women who are writing the best crime fiction right now. Thanks for starting your review saying that you can read them in no particular order, beause I want to read this last book before I go back to the beginning of the series. Also, I’m sure you read them already, but the Jackson Brodie series by Kate Atkinson are another great example of how well-written series’ installments have their autonomy. I have one of her books, will have to move it up on the pile.